My sewing inspiration this week comes from the 2006 Alexander McQueen ready-to-wear collection. I love this entire collection so much and I hope to make several pieces inspired by McQueen's genius for my autumn/winter wardrobe! I am so bummed I missed the Met 'Savage Beauty' exhibit! I have signed a petition aimed at trying to convince the Met and donors to take the McQueen exhibit on the road (and particularly to bring it to the UK)! Did you see the exhibit? Oh! What a good idea. I can't wait to see what you do with your inspiration. Some Ness plaid? LOL The whole board looks great but the top left dress is calling me! Debi, I'll have my fingers crossed that the exhibit will make it to the UK. I actually read a piece yesterday that said they were in talks with a "major British museum," so hopefully it's already in the works! guess who else missed and was here in the city the WHOLE TIME. i am a total doofus. my sis-in-law waited in line 7 hours on the last day to see it! i hope you get it there soon! Love love love! I really want to rip the top left dress of the model and steal it! I LOVE this collection!! I read my friend's copy of Savage Beauty and really enjoyed it. So sad he is no longer with us. That collection was and is amazing, it was one of the major inspiration sources for me this week too! Looking forward to see what you're making! What a brilliant inspiration for a plaid challenge. I love the wit and fun in those dresses. Thanks for the link to the petition. I signed it, as I almost went to NY especially for this. I am really enjoying these images. Thanks for sharing! 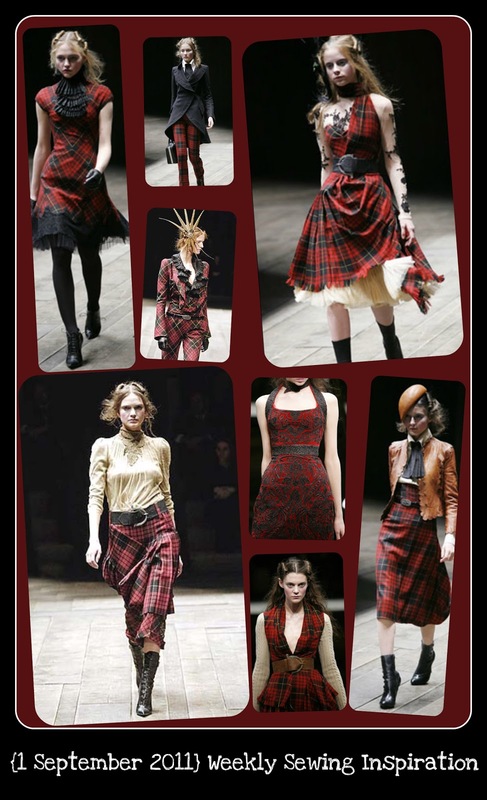 I absolutely adore the McQueen tartan collection and can't wait to see what you do with it as inspiration! I'm off to sign the petition. Oh also LOVE that collection and have it on my inspiration board too, I'm such a sucker for plaid. Catching up on your posts here. I adore these tartans and what A. McQueen did with them, amazing. It makes me want to do like you and create something similar. I have a passion for that black lace on the bottom of the skirt, gorgeous can you imagine!! The hem looks jagged and then the lace has what looks like tule under it. Oh gorgeous. How can we make something like this Debi? I'd forgotten about this! I was an avid style.com reader at the time and loved the entire collection. I think the dress with the ruffled jabot is my favorite.